heather kojan quilts: The Improv Handbook for Modern Quilters Blog Hop - part deux- and a Giveaway!! 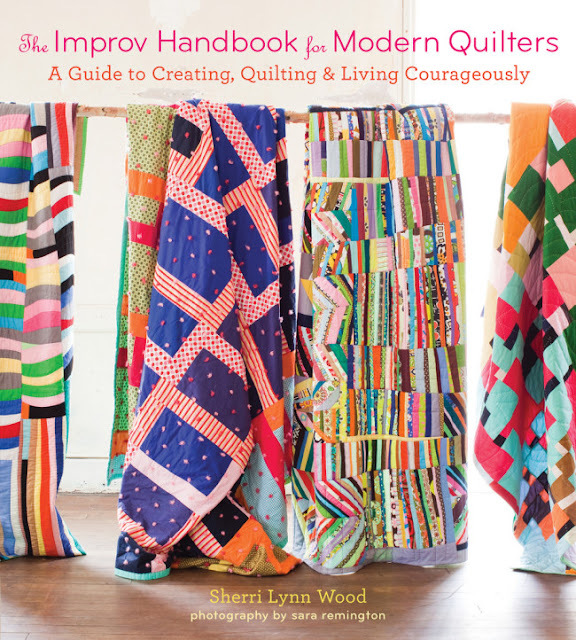 The Improv Handbook for Modern Quilters Blog Hop - part deux- and a Giveaway!! It was December of 2013 when I first heard of Sherri Lynn Wood. A guild member had suggested her as a speaker. Curious, I popped over to her blog to check her out. 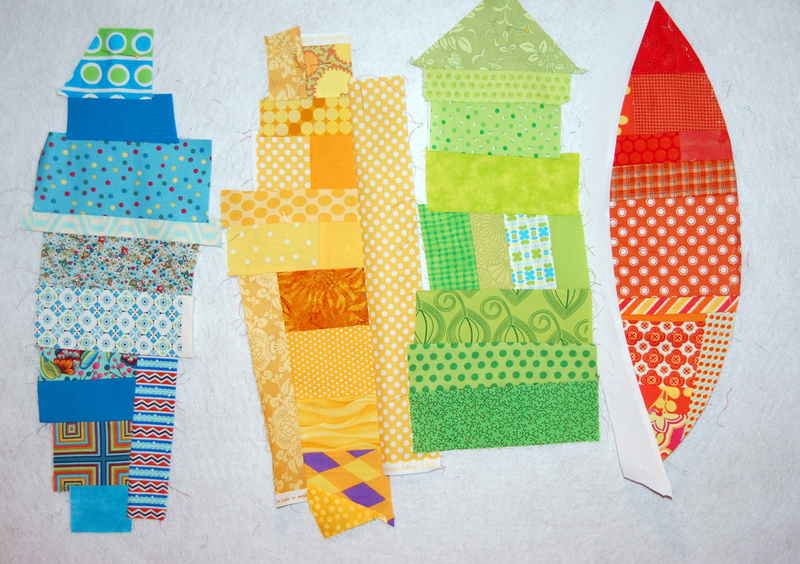 I hadn't done a lot of improv quilting up to this point (that was about to change!) and was intrigued by her quilts. It just so happened she was putting a call out to quilters to test some ideas she had for her upcoming book The Improv Handbook for Modern Quilters. I'm a hand raiser. I said yes. A week later I was given my assignment. I was to test her Bias Petals score. Sherri gave us some general guidelines and links to helpful videos. Then it was up to us to create. From the beginning, I knew I would improv piece the centers of my petals. From there, I figured I'd arrange them in a flower shape and call it a day. Eh, it's okay. Not great. I took the shapes to my design wall. There they were, all lined up like little kayaks. Or surfboards. And after I talked myself off the ledge, I figured it out. But really, it wasn't until I got to the point of squaring up the rectangles, that I felt comfortable again. That's what improv (and this book) will do to you. Push you out of your comfort zone, make you try new things, make you make things you don't like, until you get to the other side and realize you love what you made. I took a picture. Sent it off. Hoped for the best. 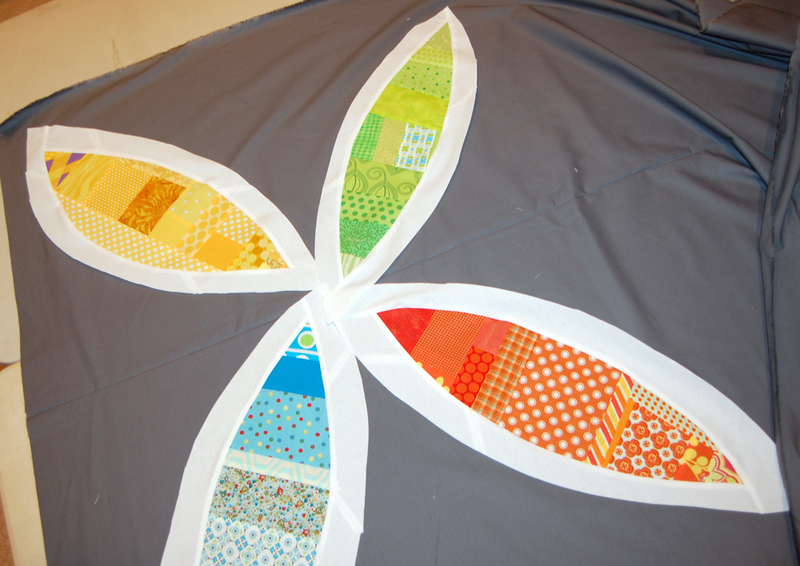 Thank you for submitting your quilt, "Surf". We love it and would like to publish it in the Improv Handbook for Modern Quilters. There were 164 amazing submissions and 22 were chosen for publication. Congratulations! About that giveaway.....would you like to win a copy of the book? Just leave a comment about improv piecing. Love it, hate it, never tried it, etc. For an extra chance, follow me on instagram, then come back and let me know. A winner will be chosen July 13th. Please make sure I have a way to reach you by email. Great job, Heather. 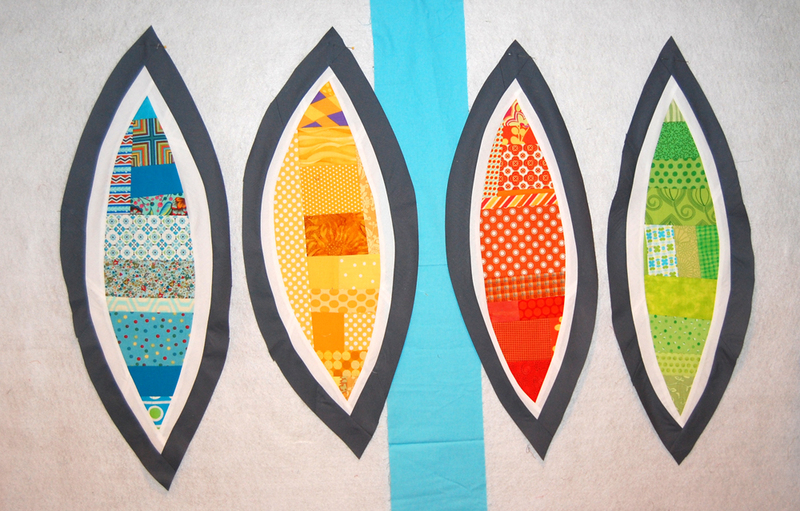 Your quilt makes me want to go surfing (well, maybe not but I like it). I would love to have a copy of this book; thanks for the chance. Great job Heather! I already have the book, since I am so intimidated by improve quilting. I think it will really take me to the next level. Congrats on your quilt being chosen! P.S. I follow you on Instagram. Thanks for the giveaway. I haven't tried improv - yet!! LOOOOVVVE Surf! The petal design is the one I am most intrigued by. I adore your Surf quilt. I'd love to have the book and be challenged to try improve. I'm one that usually follows a pattern to a T - even when I think there is a mistake. Congrats on your publish. I'm thrilled that you are a hand raiser and met the challenge. I love that they look like surf boards. The technique is appealing - I want to try it myself! Great work, and thanks for the book opportunity. I love improv piecing. I'm most confident when I'm working that way. I have the book, but I haven't tried any of the scores yet. Our guild hosted Sherri Lynn last year and I really enjoyed the class. I love improv and I need this book. I love your interpretation of the leaves. :) Awesome, Heather! It's beautiful. love love love the improv! its so much more fun, even when you have to figure something out. Like improv piecing as well as mixing it with traditional. I love Surf. I'm a new devotee to improv and am definitely hooked. I adore improv! So much fun to get lost in the process! Plus, I am not a person who is exactly...exact. So crisp corners and precise seams are not my forte. So great to have "permission" to let go! By the way I LOVE your surf quilt. I've tried improve and hope to get more relaxed about doing blocks in this style. Your book looks awesome and I love how your surf quilt came together. I've made some timid attemps at improv. This book would really give me a boost! I've been trying improv on small projects, like placemats. It's a start! I go through phases where I love improv and where I don't. Thanks for a chance to win the book! So far I've made 2 quilts - both improv. It just feels more accessible and inviting to me than patterns. The book looks wonderful! (mprov piecing is a challenge for me. This book may save me. Do like your "surf" quilt. I am a rank beginner with improv quilting, and could use all the help I can get. I get the willies, just trying to not match my points. Took me 3 days and 7 or 8 attempts to make a wonky 9 patch block. Those petals could push me over the edge. LOL I do hope I win this giveaway. This old quilter would love to learn a new trick. I have done only a little improv piecing (mostly on pot holders) and have enjoyed it. I would love to learn more and try some things currently out of my comfort zone. 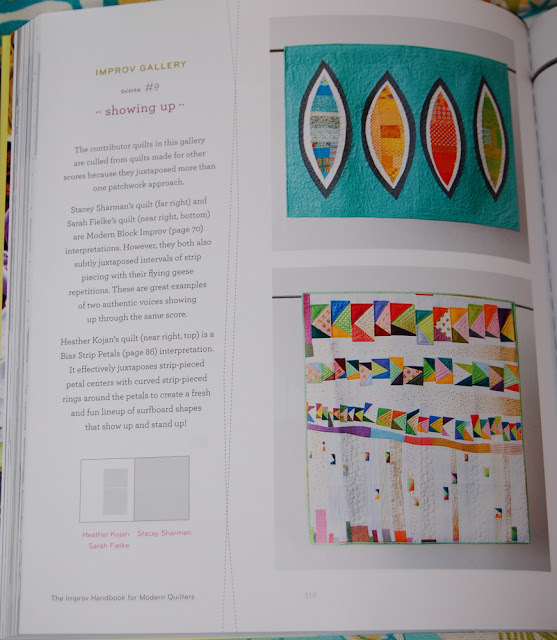 Your quilt is great, and how wonderful to be in the book. Congratulations! i've done some when i was trying to make some thing else , does that count? I'm usually a symmetrical person, but at lunch one day at work, I happened upon some improv blocks. I couldn't wait to get home to try it! I finished a crib-size quilt from start to finished, binding and all, in one weekend. I loved it. Definitely out of my comfort zone, but it turned out so cool! I already follow you on Instgram. Love your surfboards. I do love improv but I have not done any recently. Need to make some more fabric from my scraps. I love improv piecing. I always think it will be quicker and easier, and find that it takes longer, is more challenging, and that I love the process and the outcome so much more than anything else I do. I follow you on Instagram, where I am @wordygirl11. Improve piecing intimidates me! But you inspire me to step outside my comfort zone and give it a try. I enjoy it as it gives me a break from "the rules". I follow on IG, thanks! I still haven't tried improv piecing, but it's definitely something I WANT to do. I just haven't been quilting very long yet. I WILL do it though... ;) (I've only made 4 tops so far and while technically none of them are improv, I feel like all my quilting is done by the seat of my pants. I hate hard and fast rules and don't want to read directions so much while in the midst of a project. I like to see what someone else has done, how they did it and then kind of figure it out as I go. Wow - these are awesome quilts! Have not tried this technique (yet!!) but so inspiring!!! I don't do it often, but love it when I do. It's so freeing, but usually I have a very specific pattern in mind when I make things. My best compromise is to make something that's improve and set it into a background that is anything but. I like the modern birches pattern for that, for example. My first quilt ever was an improv-pieced one. 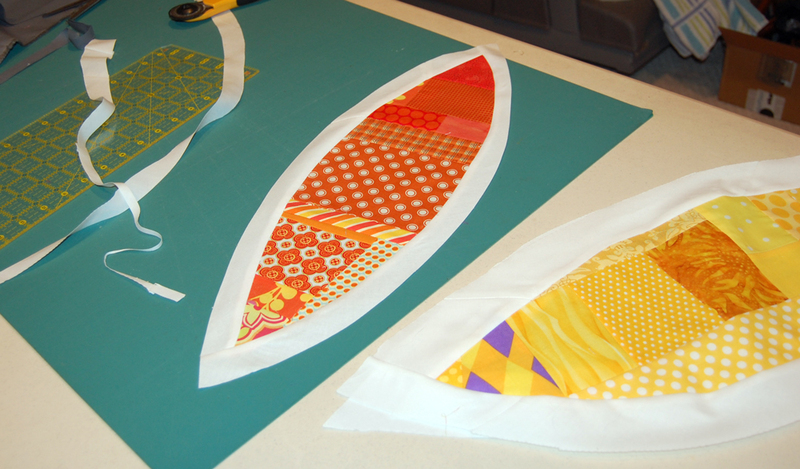 I am glad I started with it because I had resisted quilting for years because I thought it would be too precise for me. Improv is my favorite kind of quilting! I love making the decisions as i go. Love it - want to try it! sorry about that delete: Congratulations on getting your quilt chosen for the book! I love your improv piecing of the leaves/petals, and the placement and colors you chose. I've tried improv piecing, and want to do much more! Thanks for the inspiration; I'd love to win this book. I've never tried improv quilting but I'm eager to give it a try. So I would love to win a copy of the book to help me get started. Thanks for the chance to win. I so appreciate your honest description of your process. Improv is my friend, but I still get stuck and have to put things away for a while before they make sense again.